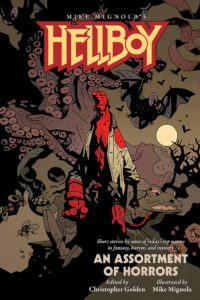 Soooo, one of the secrets I’ve been sitting on this year is the new Hellboy prose anthology, Hellboy: An Assortment of Horror, in which I haz a story. Very excited about this, and very grateful to Mike Mignola and Chris Golden for asking me to contribute. Awesome ToC includes (but might not be limited to): Chelsea Cain, Jonathan Maberry, Seanan McGuire, Richard Kadrey, Chris Roberson, Paul Tremblay, Delilah Dawson, Laird Barron, Angela Slatter, Chris Priestley, Michael Rowe, Rio Youers, Kealan Patrick Burke, E. Lily Yu, Weston Ochse. This entry was posted in fairy tales, News and tagged angela slatter, Chelsea Cain, Chris Priestley, Chris Roberson, Christopher Golden, Delilah Dawson, E. Lily Yu, hellboy, Jonathan Maberry, Kealan Patrick Burke, Laird Barron, Michael Rowe, Mike Mignola, Paul Tremblay, Richard Kadrey, Rio Youers, Seanan McGuire, Weston Ochse. Bookmark the permalink.